FlameShield™ 1500 vermiculite coated fiberglass fabric is high temperature, heat and flame resistant thermal insulating fabric that will withstand temperatures of 1500°F / 815°C continuous exposure. The base High Temperature fiberglass fabric is fabricated from high quality type E fiberglass that will not burn. The fabric is then coated with a vermiculite dispersant. 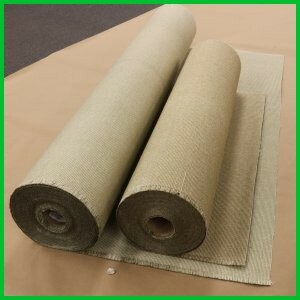 The vermiculite coating also adds abrasion resistance to the fabric. Tested and certified to meet ASTM E 162, ASTM E 662 and SMP 800-C for surface flammability, smoke and toxic gas generation.